Our Miss Gibbs (Gaiety, 23 January 1909) was the greatest success of all the Caryll and Monckton collaborations; but it also became the last, when Caryll emigrated to America. It was a star vehicle par excellence for Gertie Millar, playing Mary Gibbs, a Yorkshire girl at Garrod’s store in London, who falls in love with a bank clerk who turns out to be an earl. 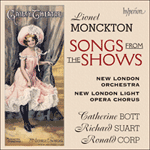 The refrain of her innocent Act 1 entrance song Mary encapsulates as well as anything the infectiousness of Monckton’s writing. However, the song that has above all come to represent the Gaiety era is Moonstruck, performed apropos of very little in pierrot costume in a second act topically set at the 1908 Franco-British Exhibition at the White City. When I’m nothing of the sort. Chorus of Dudes: But you are! Mary: No, I’m nothing of the sort. Chorus of Dudes: Yes you are! I don’t believe them, for they often tell me fibs! Chorus of Dudes: Oh, believe us, do! When my name’s Miss Gibbs. So do believe us, for we never tell you fibs! Mary: Yes, you tell me fibs! Though your name’s Miss Gibbs. And my name’s Miss Gibbs. Mary: Miss Gibbs, if you please! Chorus of Dudes: Let us call you Mary, dear! No 20: Moonstruck Moon, Moon, mischief-making Moon! Mary: Moon, Moon, mischief-making Moon! Up in the midnight air. You will shoot me with your silver bow. Well, it’s then I feel a foolish sort of feeling coming on! I can’t keep still, although I try. That is the moment when I long to dance. When the moon comes creeping up the sky! Mary: Moon, Moon, aggravating Moon! Why do you tease me so? That isn’t right, you know. Doing ev’rything that I am told. Well, it’s then I’ve such a flighty little, foolish little head!